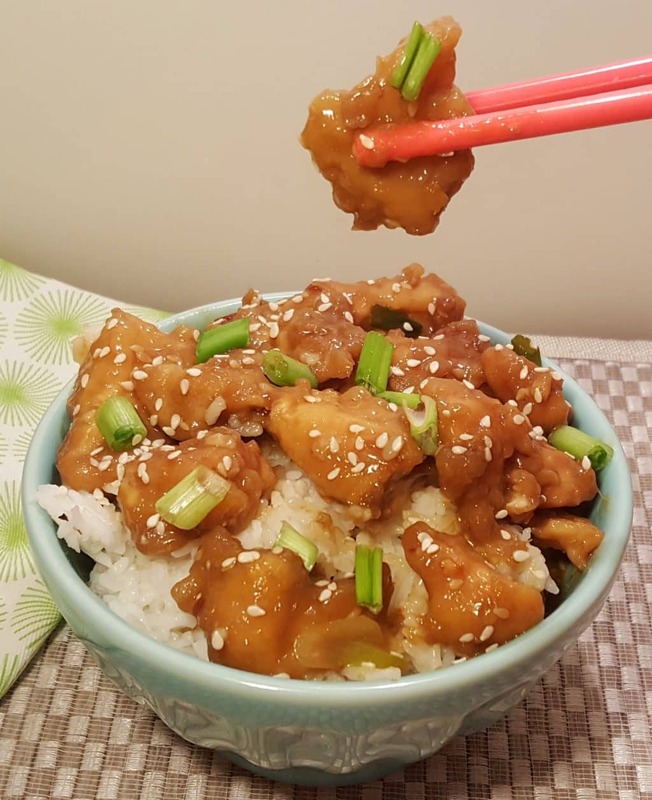 Moist and Juicy Pressure Cooker Chinese Take-Out General Tso’s Chicken are bite size nuggets of the popular sweet and spicy chicken dish. 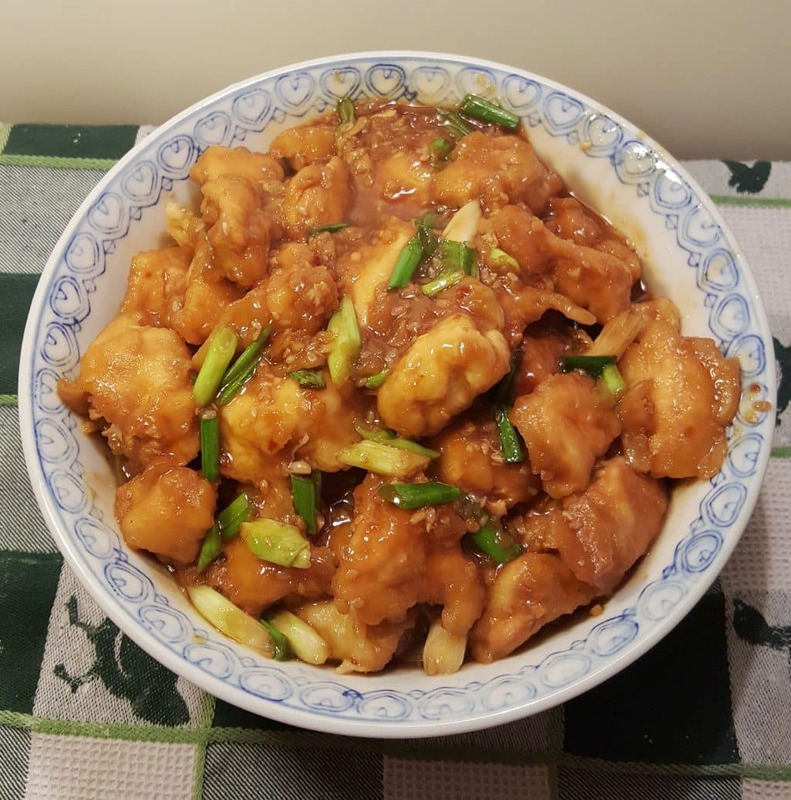 In my series of Chinese Take-Out recipes, comes Pressure Cooker Chinese Take-Out General Tso’s Chicken. Succulent, moist and juicy morsels of chicken result from my original and unique cooking technique. 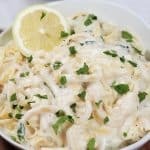 No more Pressure Cooker dried out and rubbery White Meat Chicken! For other Chinese Take-Out recipes, try my Pressure Cooker Chinese Take-Out Sweet ‘N Sour Chicken and my Pressure Cooker Chinese Take-Out Spicy Orange Beef. General Tso’s is not actually the creator of General Tso’s Chicken. Peng Chang-Kuei the Taiwanese restaurant, was accredited with General Tso’s Chicken. The original recipe is not nearly as sweet as the US version. The salty Soy Sauce is also a more prominent taste. 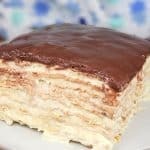 I tried to create a recipe that is somewhere in the middle of the two versions. Sweet/Black Soy Sauce is something I use all the time in my Asian cooking. Sweet/Black Soy Sauce is a thick sweet syrup, much like molasses with a bit of a salty taste. Please don’t confuse it with Dark Soy Sauce, which is saltier than the more common Soy Sauce, which is easily found in most grocery stores. You can substitute the Sweet/Black Soy Sauce for Molasses or Brown Sugar and 1 teaspoon of Light Soy Sauce if you like, but I strongly advise against it, if you want authenticity. 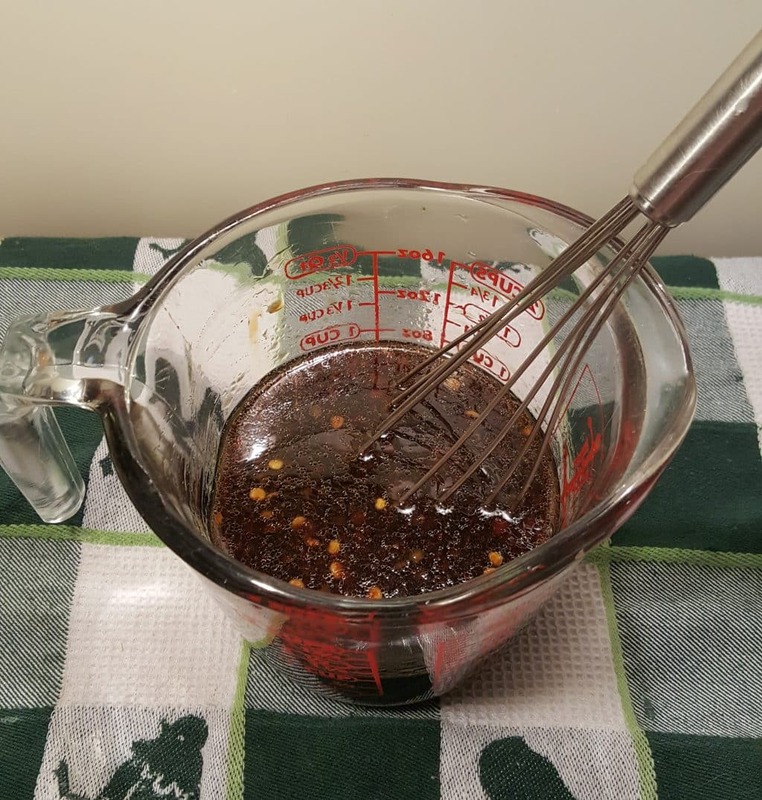 Here is how to make a good substitute, Nuoc Mau Vietnamese Caramel Sauce Recipe. 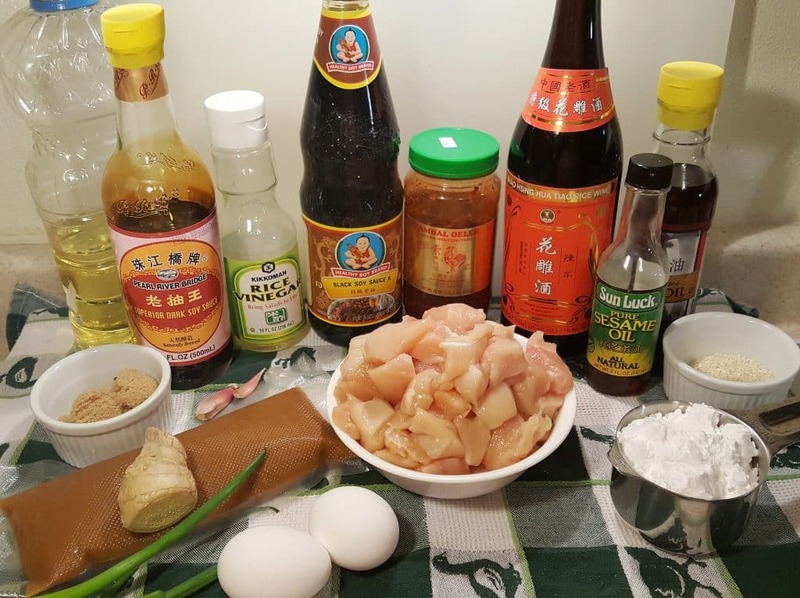 It’s a Vietnamese Sauce, but works fine in other Asian cooking. If I were you, I would invest in Sweet/Black Soy Sauce, as it adds a really nice depth of flavor to Asian dishes. It has just the right amount of saltiness, without going overboard. Use a Measuring Cup or other vessel and Whisk together all Sauce ingredients and set it aside. 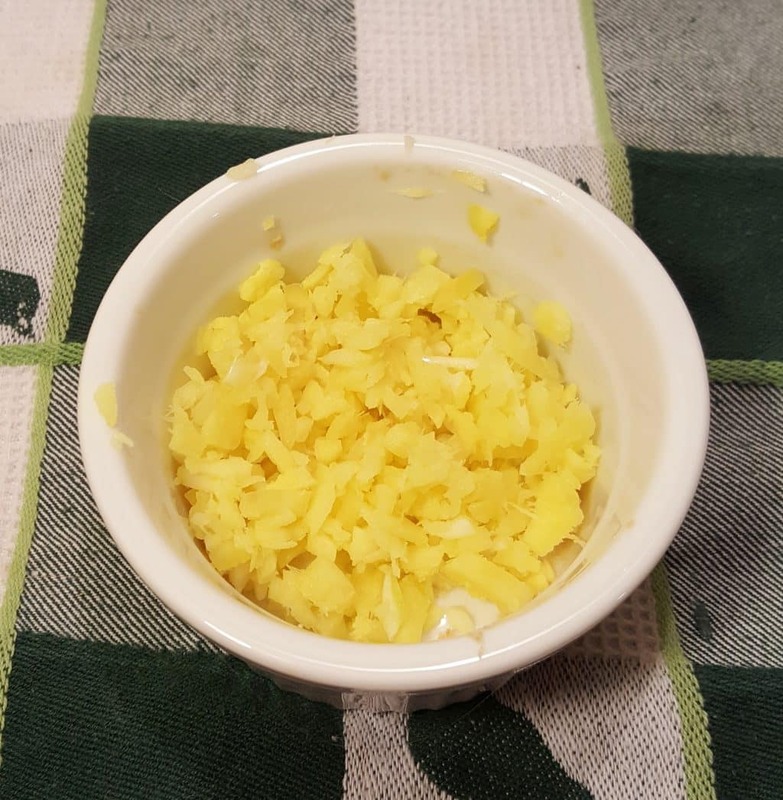 The smell of Fresh Ginger and Fresh Garlic is intoxicating. I love to mince them both up really well and add a little oil, to make a delicious paste to use in Stir Fry cooking. For this recipe, just mince up the garlic and ginger. Crack open the Eggs in a bowl and whisk the eggs really well. Set the Eggs aside. 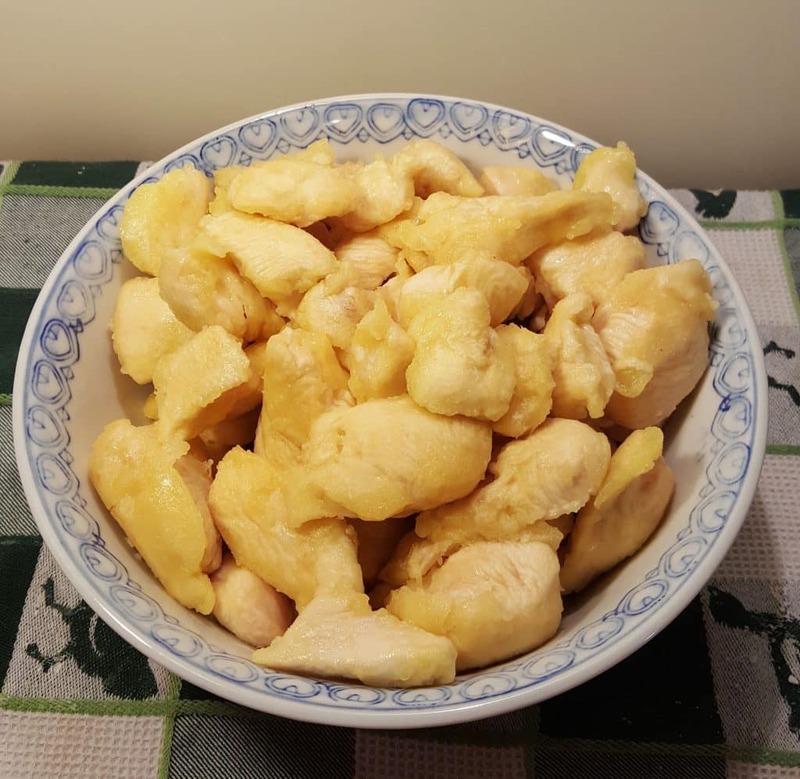 Cut the chicken into pieces that are a little bigger than bite size. Pat dry the chicken chunks. 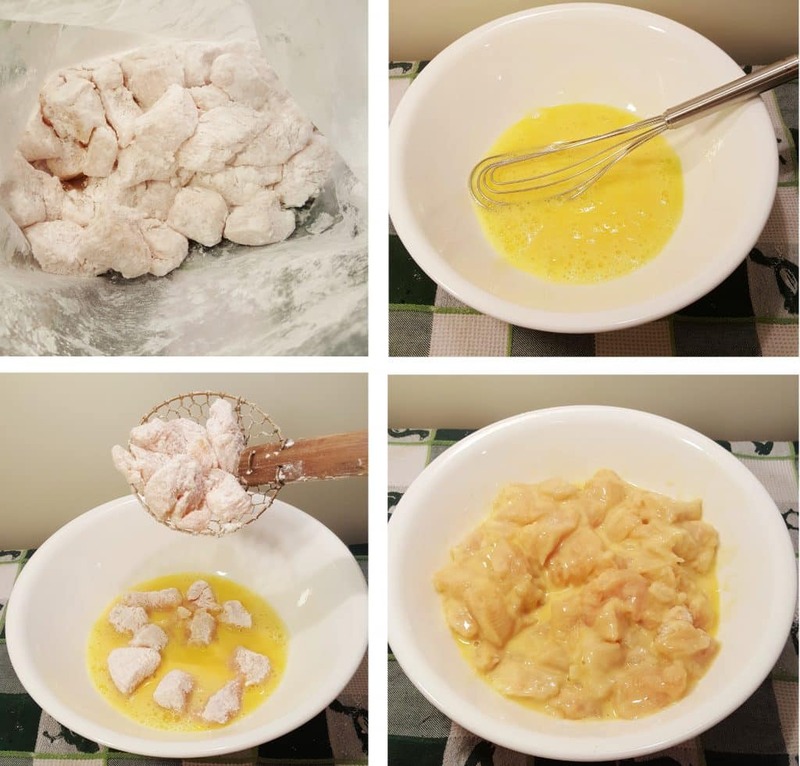 In a Ziploc Bag or bowl add the chunks of chicken and pour in the Potato Starch. Shake the bag to coat the chicken. You might want to seal the bag first. Trust me on this. Make sure the chicken is completely coated. Using tongs or a Bamboo Strainer, shake off excess Potato Starch and dip the pieces into the egg. Always, always, before adding oil or fat to your Stainless Steel cooking pot, heat the pot fully. It takes about five minutes. Instant Pot users, your pot will say HOT. In batches, place chicken in the Pressure Cooker and Sear on all side. Make sure to drip off the excess egg and separate the pieces of chicken in the pot. You don’t want to cook the chicken, just quickly sear it on all sides. The chicken will start to puff. 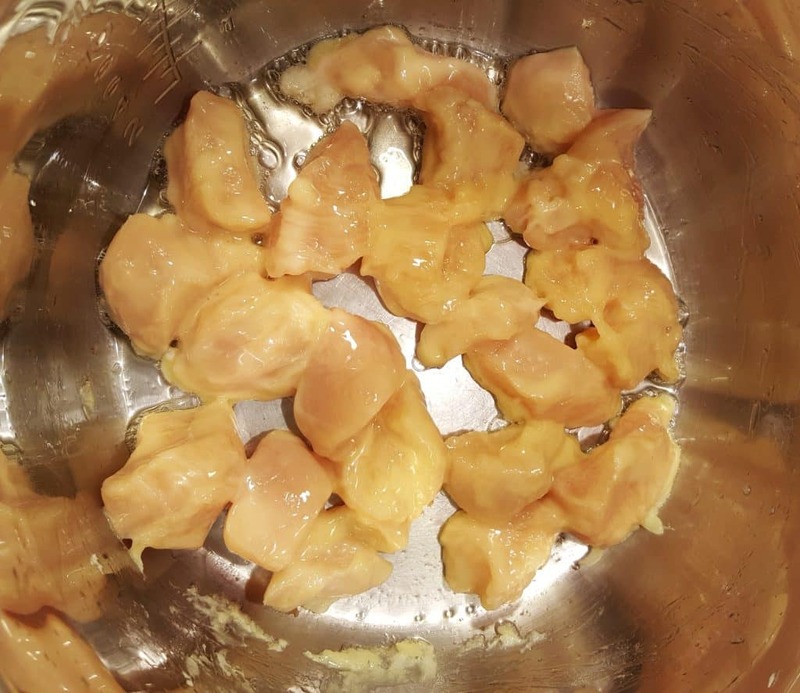 Remove Seared Chicken to a Bowl or Plate and repeat the process, until all chicken has been seared. If you want to toss in the Sesame Seeds to Toast, do it now. 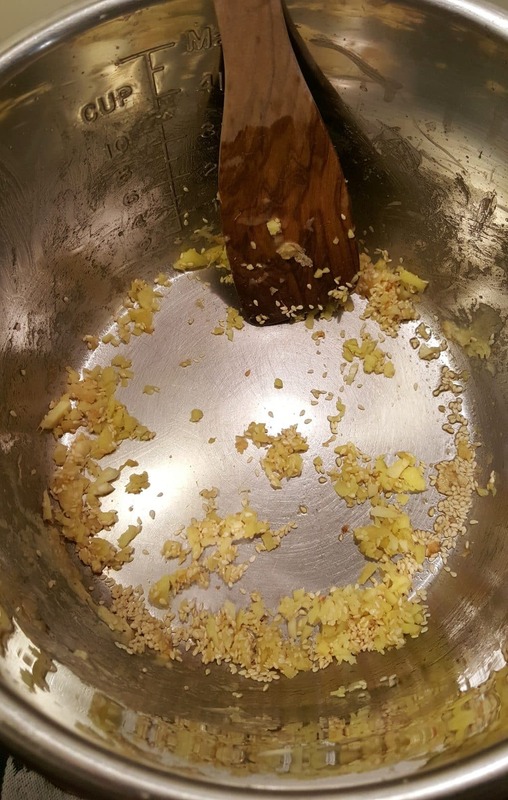 Add in the Aromatics, the Minced Ginger and Garlic and Sauté for about a minute, or until the fragrance is released. The scent will be wonderful. 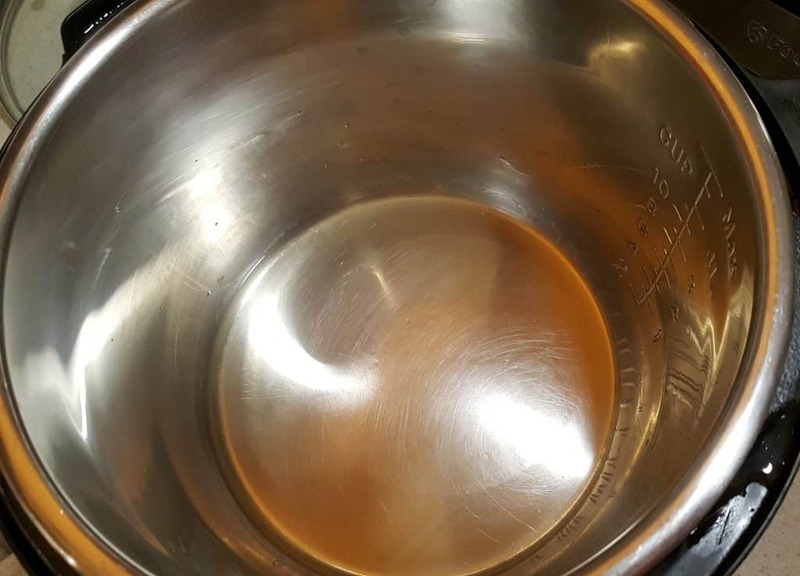 Your pot should not need to be deglazed, if you heated it before adding the fat. However, after adding the Chicken Broth and the Sauce Mix, if you did have any sticking, the liquid will deglaze the pot. Allow the liquid to come to a slow simmer and then turn off the pot. Carefully place the Breaded Chicken into the Sauce. You are now ready to cook. 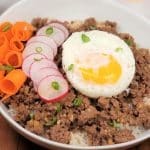 If you want to make this a one pot meal, follow the directions for my Perfectly Cooked Pot in Pot Rice recipe and make this a one pot meal! 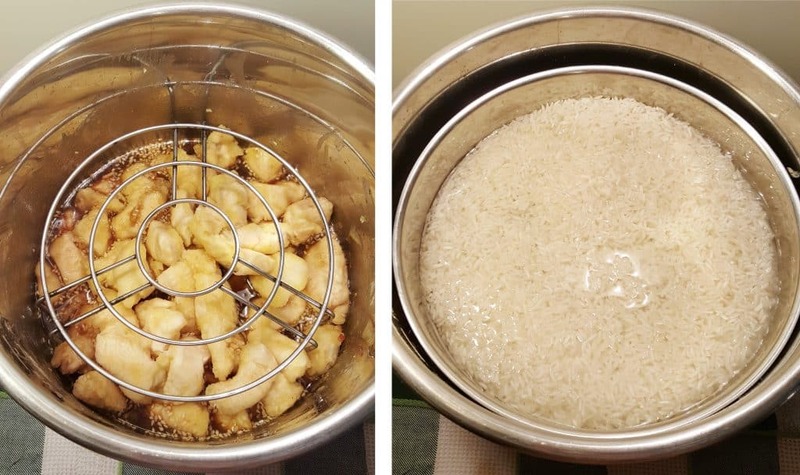 A Stainless Steel Tall Trivet and a Round Stainless Steel Rice Pan is all you need to turn your Pressure Cooker Chinese Take-Out General Tso’s Chicken into a One Pot Meal! If you have used my Pressure Cooker Perfectly Cooked Pot in Pot Rice recipe, carefully use a Pan Retriever and remove the pan of rice and the Trivet. Scoop out the Chicken and place in a bowl. 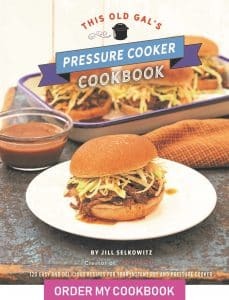 Turn off the Pressure Cooker and then Select Sauté or Browning on your Pressure Cookers. If you don’t have either of those two buttons, just push any button, like Meat or Chicken. Add sliced Scallions. Simmer until the Sauce for about one to two minutes. It should thicken up, almost right away. 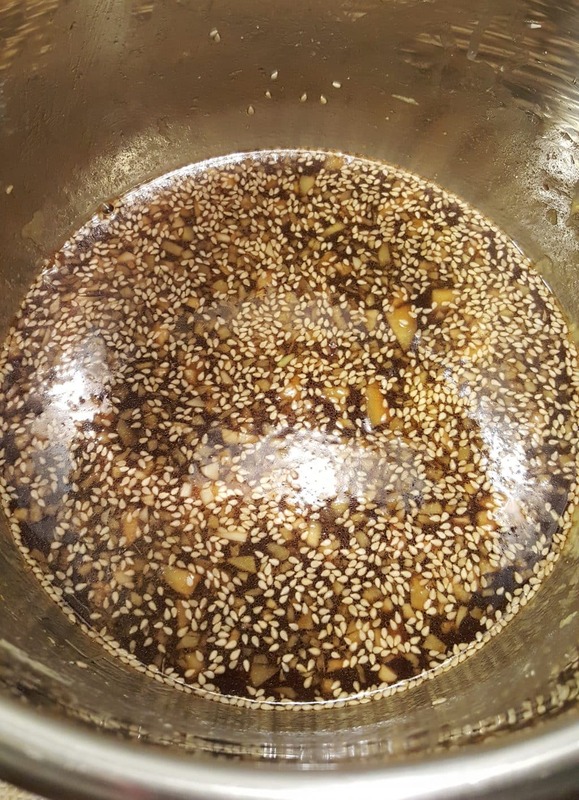 Pour Sauce over chicken and sprinkle with Toasted Sesame Seeds. 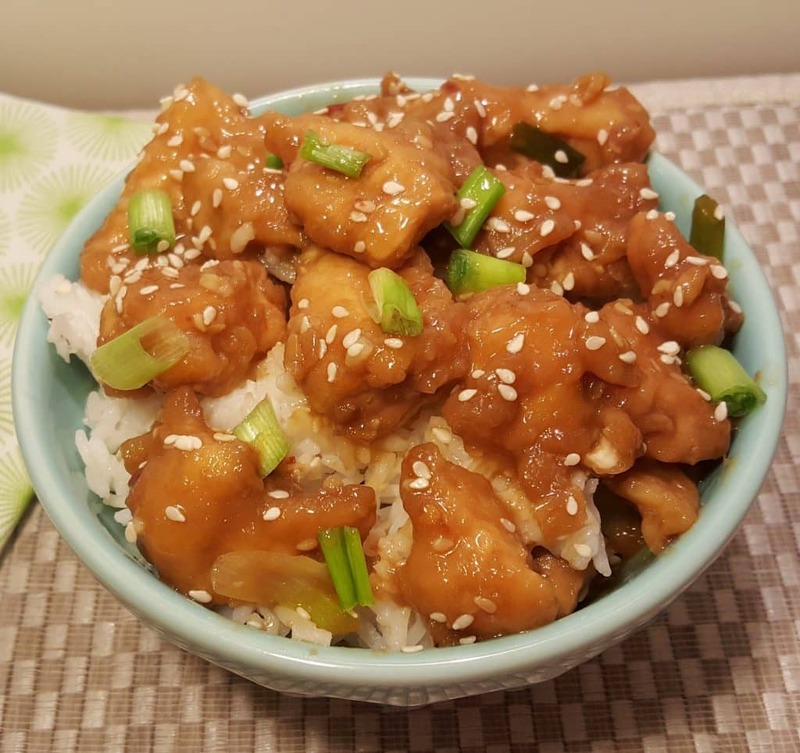 Serve this Pressure Cooker Chinese Take-Out General Tso’s Chicken over Rice. For a delicious appetizer, try my Air Fryer New York Style Shrimp Egg Rolls and/or my Pressure Cooker P.F. Chang’s Garlic Noodles. Dip chicken into the egg mixture and set aside. Select Saute, Browning or other button on your Pressure Cooker and allow pot to fully heat. Add oil to the cooking pot. 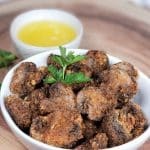 Using tongs, pick up Chicken pieces, shake off excess Egg and place in Pressure Cooker cooking pot, being careful not to crowd chicken. Sear Chicken on all sides and remove to a plate. Repeat, until all Chicken has been seared and puffy. Add a drop of Sesame Oil and dump in Sesame Seeds to toast. Add minced ginger and garlic and saute for one minute. Add chicken broth and sauce mixture whisk together until a slight simmer. Turn off Pressure Cooker. Carefully place Chicken into sauce. If making this a One Pot Meal, add the Trivet and Prepared PIP Rice Bowl now. Lock on lid and close Pressure Valve. Cook at High Pressure for 3 minutes. When Beep sounds, allow a 10 minute Natural Pressure Release. Remove lid. (Remove Rice and cover tightly to allow the rice to finish cooking) Remove Chicken to a bowl. 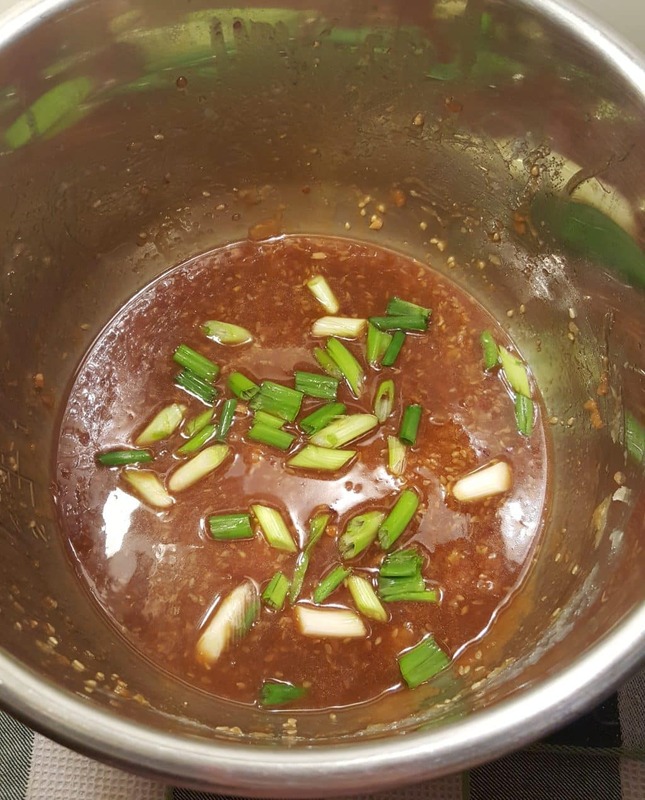 Add cut scallions and simmer sauce until thick. 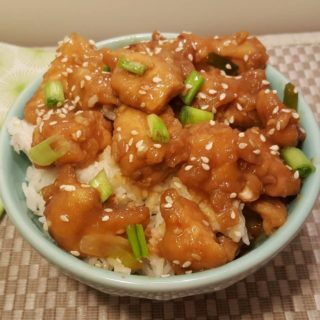 PIN this Pressure Cooker Chinese Take-Out General Tso’s Chicken! What can the potato starch be replaced with? Cornstarch maybe? Mine is almost 3 in…yea!!! I made this for my husband tonight, as he loves General Tso’s Chicken. It was a big hit! I will definitely be making it again and again. Hi Jill, unfortunately I’m staying in Cairo, Egypt for a few months and there isn’t anything remotely authentic when it comes to Chinese food… even the “Asian” restaurants here are big disappointments. Also, I am non-alcoholic so no wine of any sort goes into meals. I was wondering if there was a good substitute for Chinese Shoaxing or Shaoshing Wine? 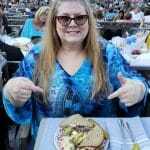 (I miss these foods so much, but constantly having to substitute the substitutions gives me a very watered down or just not right dish at the end) Which is why any help would be very much appreciated, as I am seriously on a craving binge! Perhaps a drop of apple juice might help. Of course, the flavor won’t be exactly as intended, but hopefully you will still enjoy your meal. 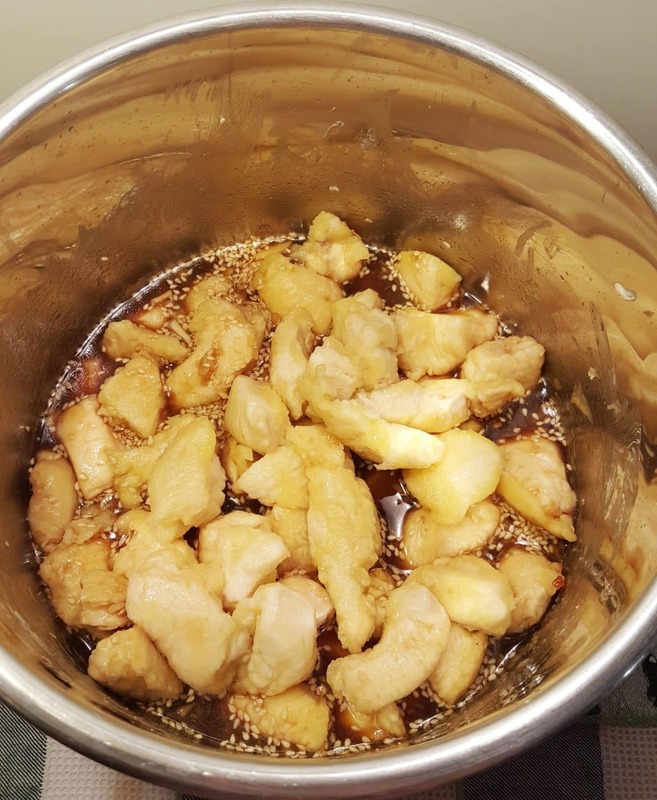 Did you really fry three pounds of chicken in only 2 Tbsp of peanut oil? And only 2 eggs covered all that chicken? Mine was looking good until I put it under pressure. Some of the chicken was as pictured and the rest separated from its coating and was a mushy mess. Any ideas where this went wrong? Do you mean potato starch is added to eggs and then to dip chicken in it?